Let our expert contractors upgrade your kitchen, bathroom, or laundry room with our professional tile installation or repair services. If your kitchen needs an upgrade, the best way to see a dramatic difference is to replace your tiles. Over time, tiles and grout can crack or become loose. Replacing them will freshen up the look of your kitchen and make it feel like a whole new home. Give your family a reason to gather in the kitchen again. Kitchens are also an extremely important aspect when it comes to the resale value of your home and tile replacement can increase that value substantially. Our contractors can also assist with tile installation and design for new home construction. Our tile installation services aren’t limited to floors. We can install backsplashes and wall tile in your kitchen, bathroom or other areas of your home. At Dream Construction, our goal is to help you achieve your dream home. Whether you’re building a new home or remodeling one you’ve lived in for years, our specialists can perform a wide range of tasks from designing a kitchen backsplash to a complete kitchen remodel. No project is out of our scope. Have you always wanted a custom tile shower to start your day in? Not a problem. We can include that and much more in the design of your new home. For tile installation and repair in the Las Vegas valley, contact Dream Construction. Tile is an amazing addition to your home. Due to its durability and life expectancy, it is the most common type of flooring in Las Vegas homes. 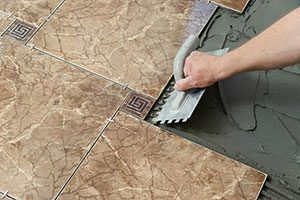 Learn more about our tile installation and replacement services by giving us a call today.